...health researchers and professionals are (or should be) asking how Brexit will, and could, affect public health. Among the questions, informed by a political economy perspective on health and its social determinants, five stand out. One needs to remind oneself that the last word in Albert Camus’ famous essay about suicide is ‘hope’. But it is hard to sustain in these times. Some public policies should carry health warning labels like cigarettes or uncooked meat. Certainly that is true for a reckless and ill-thought-out policy like the UK government’s current approach to leaving the European Union, after a close advisory referendum in which at least one of the campaigns would quickly have run afoul of trading standards law if had involved a consumer product. As controversy rages on about exit paths – ‘strategies’ would be too kind a word – health researchers and professionals are (or should be) asking how Brexit will, and could, affect public health. Among the questions, informed by a political economy perspective on health and its social determinants, five stand out. Whose living standards will be hit first, and worst, as sterling dives towards parity with the US dollar, or even lower? Make no mistake, it is headed that way. What will be the direct and indirect effects on housing costs, on transport costs, on the cost of a healthy diet? What kind of job losses are likely to be associated with the shift of corporate operations to locations where they are ensured of continued access to the single European market? It is certainly plausible that the most severe losses will be concentrated among the so-called ‘unskilled’, whose mobility and options are limited by lack of formal credentials. If you doubt that the locational shift will be substantial, ask yourself: how much of your pension pot would you want to invest in a country with no access to any markets other than the 64 million within its borders beyond that ensured by time-consuming WTO disciplines that its government has no experience of negotiating? I thought so. Prime Minister May herself conceded the point during the referendum campaign. Beyond these impacts on social determinants of health are those on the NHS – where those of us without deep pockets or private insurance go when things go wrong. 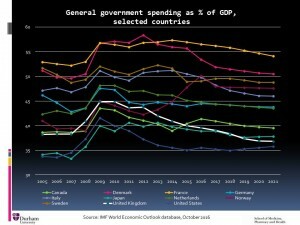 The most recent figures and projections from the International Monetary Fund show projected UK government spending as a percentage of GDP trending downward towards US levels – or, in historical terms, to the levels characteristic of the pre-war period, before the establishment of the NHS and the Beveridge approach to social policy. A public sector budget of that constrained size is simply incompatible with a comprehensive health service that is free at the point of use. 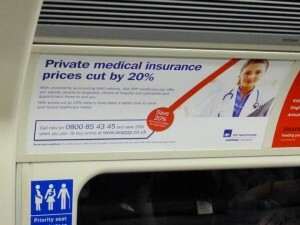 The insurance industry, as shown by a tube advertisement from 2011, understood this point years ago. 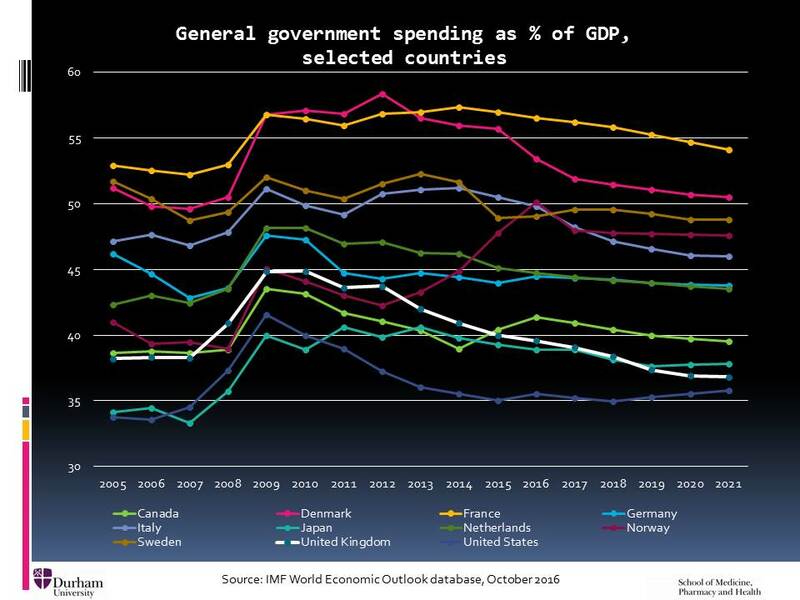 Crucially, these expenditure projects do not take into account the need (at least, so we will solemnly be told) for further austerity measures as government revenues drop with slower growth in anticipation of Brexit. In a similar vein, how will economic policy respond to the challenges of Brexit? Chancellor Hammond has recently warned (or threatened) that the post-Brexit UK might need to become a tax haven to an even greater degree than is already the case in pursuit of corporate investment, abandoning ‘a recognisably European-style economy’ in favour of ‘something different’ – travelling still further down the neoliberal road that my colleague Clare Bambra and I described in 2015. (Some of us think that was the objective of ruling class Brexiteers all along.) What is this likely to mean for public sector revenues, and for whatever solidaristic social policies have survived the post-2010 upward redistribution of income, wealth and opportunity? Finally, what will post-Brexit trade negotiations mean for the future of the NHS? A detailed legal analysis by the UK Faculty of Public Health pointed out the possible dangers of investor protections proposed as part of the Transatlantic Trade and Investment Partnership: ‘the worst case scenario for the NHS would then be that commercialisation becomes “locked in”, sealed by the threat of huge compensation claims by investors’. TTIP is now almost certainly dead, but the UK would face post-Brexit trade negotiations with both the EU and the United States from a far weaker position that it occupied as part of the EU negotiating bloc. It is hard to imagine that UK negotiators informed by the health system wisdom of Jeremy Hunt would resist opening up investor access to health services, in particular when dealing with a United States in which the health care industry accounts for one-sixth of the entire economy, with associated domestic political clout. 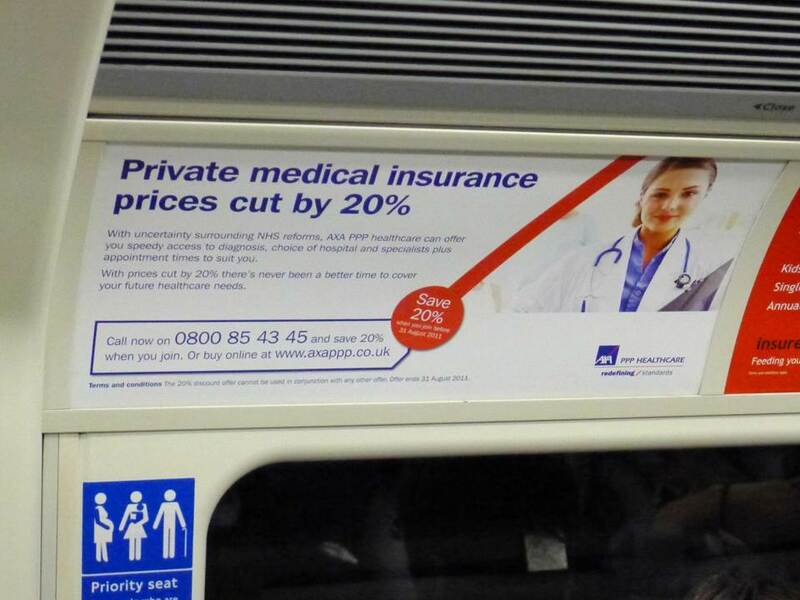 Indeed, the profit potential of a privatised NHS might be one of the most important offers available to those negotiators. One needs to remind oneself that the last word in Albert Camus’ famous essay about suicide is ‘hope’. But it is hard to sustain in these times.